Programmes and proposals for alpine skiing guided ascensions, canyoning, alpinism, rock and ice climbing, hiking. Courses and entrance examinations training. Guiding and training for disabled sportsmen in alpine skiing, climbing, canyoning and BTT. Training for professionals related with the world of disability. 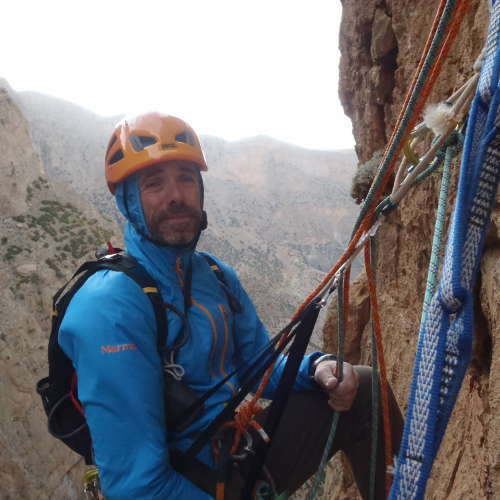 High Mountain Guide with IFMGA accreditations (High Mountain top technician), Canyoning guide (canyoning sport technician) and Alpine skiing teacher (canyoning sport technician). PDue to a personal link with disability, in the year 2000 he starts to train himself in France in driving and guiding disabled people in skiing, complementing his formation in mountain sports. Nowadays, in addition to the degrees already mentioned, Jabi is tandem-ski and dual-ski pilot, apart from being the Tessier trainer for Spain. With years of experience and work in mountains and ravines, in the year 2003 he starts a business project intended to allow him to work as a teacher and guide, including in his offer the services to people with disabilities.